Whether you’re craving the spice of curry, lentils, or turmeric, the range of options that make Indian food so good are on full display at these Wisconsin restaurants. Craving some chicken tikka? How about a vegetarian dish? These amazing restaurants have it all. Here are our favorites. Open since 2012, Dhaba Indian Bistro has been serving up some of the tastiest Indian food in all of Middleton. Their vegetables are handpicked and presented with the highest quality. Their lunch and dinner menu features an assortment of delicious things to try, such as the Vegetable pakora or the chicken with the traditional Manchurian sauce. Not sure what to try? How about an order of vegetarian or non-vegetarian for two, perfect for those who have never eaten Indian food! The Vegetarian is all about using the freshest of ingredients, herbs, and spices. No curry powder here! Everything is made to order, and they are happy to accommodate all spice levels, starting from “Don’t Worry, We’re in Wisconsin” to “Oh My God It’s Melting The Plate!” If you’re a vegetarian and don’t enjoy gluten with your food, don’t worry. The Vegetarian has you covered with gluten-free selections! They also have certain dishes that can be prepared vegan upon request, such as the Shahi Paneer or the Mutter Paneer. It’s an eclectic mix of deliciousness at OM Indian Food Cuisine in Madison, featuring authentic North and South Indian, Indo-Chinese, and Pakistani dishes with fusion specialties! The atmosphere is trendy and upbeat, family friendly, and features a Bollywood Theater room, meeting space, and a sitting area complete with a fireplace, games and books! It brings the best of the best in Indian culture. Start your meal off with the Chicken Triple 5 and an assorted vegetarian appetizer, followed by some curry fried rice, and finish it off with mango ice cream for dessert! Yum! The Sai Ram Indian Cuisine restaurant is Fox Valley’s favorite! 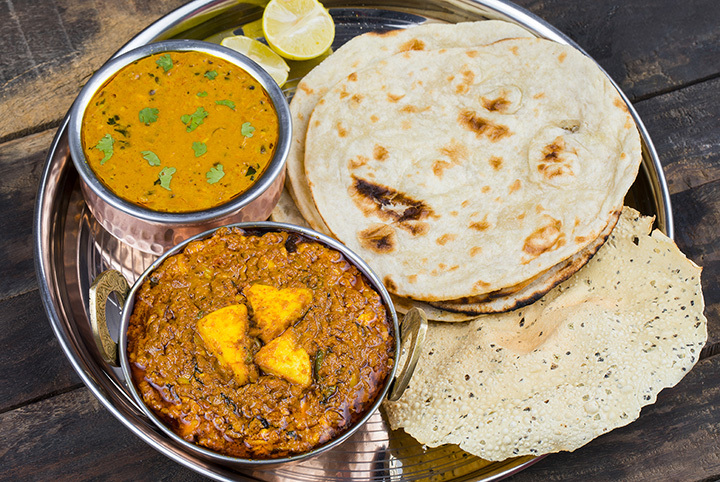 Featuring authentic dishes that include a wide variety of chicken, seafood, beef, lamb, vegan, vegetarian, and tandoori dishes, it’s easy to see why this restaurant is a favorite among the locals and visitors alike! Each dish features fresh ingredients such as the handmade bread, aloo gobi, and tandoori chicken! No matter what you order here at Sai Ram, it’s bound to be absolutely amazing! The Swagat Indian Restaurant offers visitors an authentic and unique lunch and dining experience. Enjoy amazing food paired with a rich selection of Indian beer or a glass of wine. The food is traditional, healthy and affordable; the atmosphere is quiet, relaxing and friendly. Each meal is prepared in a traditional clay oven, which enhances the herbs and spices and makes it mouthwatering. If you’re not sure to what order (and there is a lot on the menu to choose from), choose the Swagat Combination Dinners for Two, featuring an assortment of vegetarian and non-vegetarian dishes. The Café India Bar and Grill in Milwaukee is the place to be for the BEST Indian food! The café features full service dine-in, a wonderful atmosphere and dishes, as well as a heated outdoor patio for those cold winter nights, and a Hookah bar! It’s a simple place located in the heart of the city with two locations: Bayview and Walker’s Point. Try a scrumptious Chef’s Special, including vegi biryani or butter (Punjabi style) chicken. Every customer is treated like royalty at the India Darbar Restaurant in Appleton, Wisconsin. Each entrée is prepared to your request and the menu includes dishes from North and South India. From the North: Tandoori chicken, kebabs, and naan bread (a personal favorite). From the South: dosa, idli, and the spicy rasam. Dine in or carry out today! Great food and an even better staff is what visitors will find here at the Haveli Indian Restaurant in Fitchburg, Wisconsin. In addition their daily lunch buffet, Haveli also serves over 100 Indian dishes and meals! Dine in or carry out, everything is so delectable and enchanting. Try one of their Royal Dinner Specials, featuring the vegetable or meat dinner for two. And don’t forget the curry! Come to the “water’s edge” where the focus of the food is on earthy spices that are blended together in unique and various ways, creating interesting flavors and scrumptious dishes. The Kinara Urban Eatery was founded in 2013 and is a lovely oasis of the Door County Peninsula. The food is made to order and priced affordably. Enjoy to-go sandwiches or other Indian cuisine such as Kati rolls, Ghana masala, or dal! Family owned and operated and featuring a large selection of Indian vegetarian foods such as appetizers, chats, snacks, breads, curries and more is the Indian Delight Restaurant in Oak Creek, Wisconsin. They offer the best of the best in quality, authentic ingredients and there is something for everyone here. Dine in, carry out or have them cater your next event! There is also a special kid friendly menu as well!